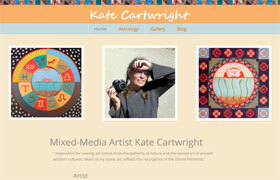 Artist Kate Cartwright is a mixed-media painter and blogger in Taos, New Mexico. The primary goal for the website was to present Kate as a unique multi-faceted artist who wears many hats as photographer, astrologer, artist, blogger and business woman. Kate is well-known as being in touch with the divine feminine through her goddess art, but more recently has evolved into a mixed-media artist focused on things in nature. Our challenge was to preserve the historic significance of the past while introducing her fans to newer pieces. Our solution was to tell the story in interesting snippets throughout the site, then present multiple opportunities to interact with Kate or purchase art and services directly from the website. Site features include a search engine friendly blog page, events calendar, social media integration, and eCommerce.